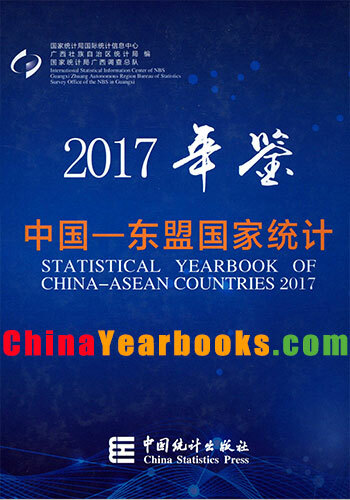 Ⅰ.Statistical Yearbook of China-ASEAN 2017(hereinafter referred to as the Yearbook) is an annual statistical publication,which reflects the economic and social development of China and 10 ASEAN countries.It covers data for 2016 and key statistical data for important years. Ⅱ.The Yearbook contains two chapters:1.Main Economic Indicators of China-ASEAN Countries;2.Main Economic & Social Indicators of China and ASEAN Countries.Chapter One covers main statistical data of China-ASEAN in general since 2005.Chapter Two introduces main statistical data of economy,trade and investment of China and 10 ASEAN countries in details. Ⅲ.Sources of data in the Yearbook:data in Chapter One are mainly from World Bank Databases and ASEAN Databases,which are excerpted by International Information Center of National Bureau of Statistics of China(NBS).While data in Chapter Two come from National Statistical Offices of ASEAN Countries and the ASEAN Secretariat,and be compiled by Guangxi Zhuang Autonomous Region Bureau of Statistics. Ⅳ.The units of measurement used in the Yearbook are internationally standard measurement units. Ⅴ.Statistical discrepancies on totals and relative figures due to rounding are not adjusted in the Yearbook. Ⅵ.Notations used in the Yearbook: “…”indicates that the figure is not large enough to be measured with the smallest unit in the table; “Blank space” indicates that the data are unknown or are not available; “#”indicates a major breakdown of the total. Ⅶ.In view of various sources,footnotes are made for each data.Readers should notice that when using the data. Ⅷ.Acknowledgements:our great gratitude goes to relevant units and staffs,from which we have received tremendous support when compiling the Yearbook.Mistakes may appear due to limited time for compiling.Please point out for correction if any.